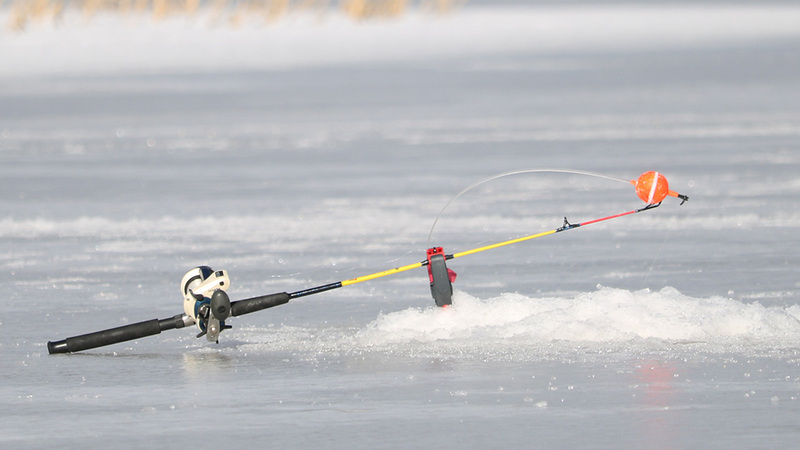 Ismete fishing, the ice spot on ice, is a modern winter fishing form. 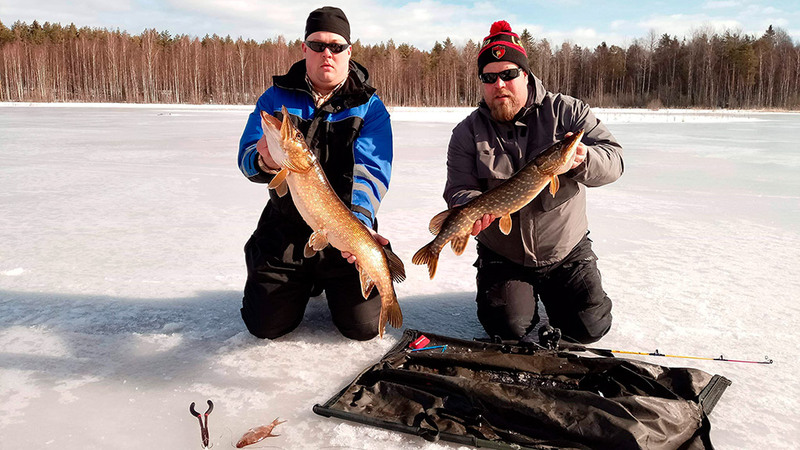 It has gained popularity among pike, perch and zander fishermen. In addition to the fishing equipment, this product also includes a guidance. During ismete fishing, the fisherman is in a hurry to monitor the fish gears that are remotely spaced. This form of fishing will surely catch a fish and it is also active way to fish. Ismete fishing is well suited with cottage holiday because it is both active fishing form and is allows you to spend time with your family or group while waiting for a fish catches the gear. While fishing it is good to have a camp fire on the ice to keep you warm and also make coffee and grill the sausages. It is also possible to put ismete fishing gear on the cabin shore and check inside in the cottage through the window if the fish is catched. If you are fishing as a group, you can play alpine curling along with fishing. You can rent ismete fishing gear, which includes a sledge for the gear and the other things. Rental fishing kit includes 6 pieces of 120cm long fishing poles, with reels and strong lines designed for 10+ kg pike. In addition, the set has racks for fishing poles and pole hit detectors, shackles, fish release mats, hooks, release pliers, and a jaw opener to release the hook easily. Vacuumed frozen baits, 20 pcs is also included. In ismete fishing one very important point is that the hole in the ice is big enough. This form of fishing might give you even 10kg size pike. When the fish is closed, the indicator of the pole rises and the sign clock battles. 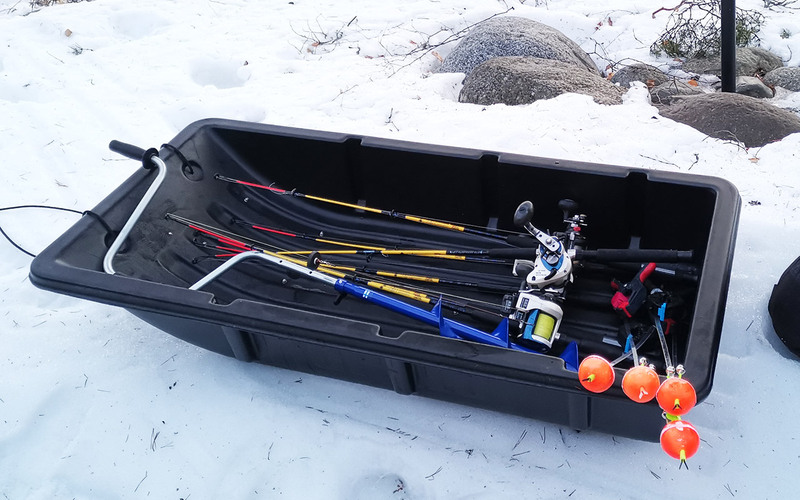 Fishing kit has an 8-inch drill that makes possible a hole of sufficient size to get the fish up on the ice. 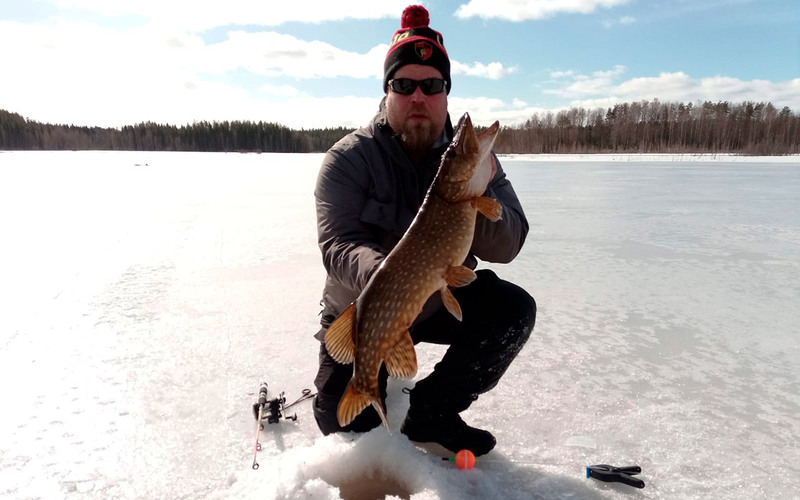 If there is no need to lift the fish up on the ice, it is advisable to remove the hook already before lifting the fish up, if possible and release fish back to the water. 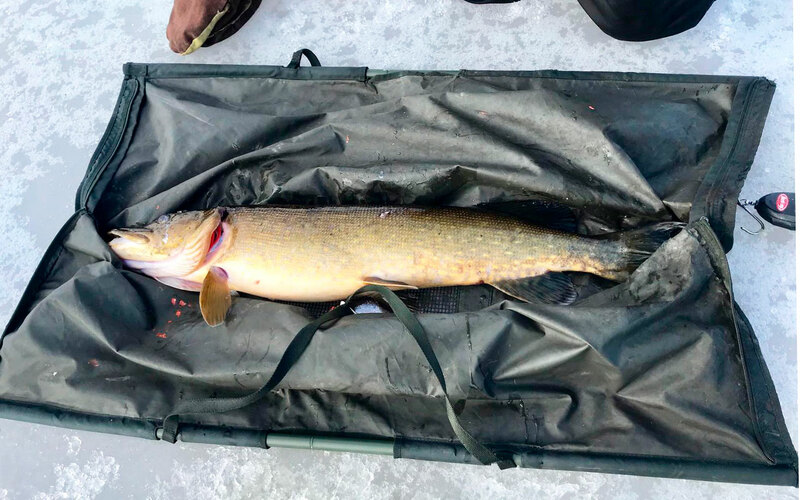 When the fish is lifted onto the ice, the lifting mat with the fish can be lifted for lifting the hook. Larger fish individuals are recommended to release back to the lake. More information about ismete fishing is available through the Youtube icons below. A special permit is required for ismete fishing: the cottages at Lake Rock and Lake Soukkio have a cottage entrepreneur fishing license that allows the use of 5 fishing poles at the same time. One of the fishermen must have a state fishing license and the it is possible to use also 6th fishing pole. We also have a guidance for ismete fishing and it is recommended, especially if this fishing form is not familiar and you are going to do it first time. When you book the guided tour, your guide will show how to use Ismete fishing equipment and how to handle fishes. We have also located good ismete fishing places, which is sure to catch. The guided tour lenght is 3 hours and along with guiding we will make coffee and grill the sausages on the camp fire. The guided tour will take place in the cottages of Lake Soukkio. After the tour, you can continue fishing independently. Please return Ismete fishing set to Rock and Lake rental office which is located at Taipaleentie 60, 51460 Luusniemi. Starting place: Rock and Lake cottages. Price: 390 € / 2 days. More questions: call +358 50 566 0905 or send email sales@rockandlake.com. Request a customized or one week renting period offer for the fishing gear together with cottage booking. Book also a guidance for fishing.